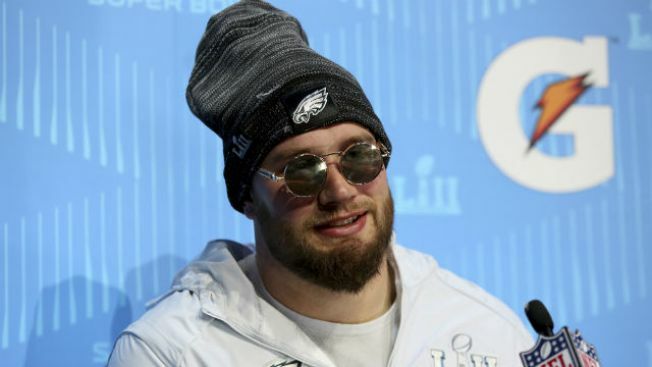 Update: Lane Johnson … still not a big fan of the Patriots or the Patriot Way. You'll probably remember shortly after the Super Bowl in February, when Johnson went on the Pardon My Take podcast and let loose on the Patriots' culture, calling New England a "fear-based organization." And then you'll probably remember when he went back on the same podcast later in that month and doubled down. Now, he's … tripled down. But at least this time, on the Steve Austin (Stone Cold!) Podcast, Johnson went into a little more detail about the origin of his distain for the Patriots. "Here's what pissed me off," Johnson answered when asked by Austin about the differences between the Eagles and the Pats. "The Patriots, obviously, I respect their coach, I respect Bill (Belichick), I respect Tom Brady, but just because they won Super Bowls the Patriot Way, is that supposed to be how everybody else is supposed to do the same thing? No, it's not. And that's what I got mad at, the arrogance of them. "There was obviously some stuff behind closed doors. Their owner talking s--- to our owner. Bill talking s--- to our head coach before the game. I'm not going to say it, but a lot of s--- built up to that and I just got tired of hearing about it, man, to be honest. I saw a defense that wasn't overly talented. It was all really about containing Tom Brady. We had a hard time doing that; he had 505 yards. But that was really it, man. Going into the game, I'm not going to be shell-shocked by it. That was kind of our thing going in. I think we had the upper hand on that." This is the first time anyone has mentioned possible trash talk between owners or coaches of the two teams leading into Super Bowl LII, which the Eagles won 41-33 back on Feb. 4 in Minnesota. It seems like Johnson, perhaps even before then, had become annoyed by the aura that seemed to surround Belichick, Brady and the mighty Patriots. "The way I try to approach the game, I try to approach it fearless," Johnson said. "We talk about the Patriots, I got in a lot of trouble running my mouth. But my thinking was they give too much respect to these f------ guys. Everybody is half-assed scared of them and they're beat before they get on the field. I ain't playing Tom Brady; I don't give a f--- about him. "I know that defensive line ain't going to do s--- against us and that was kind of my approach. I'm out there talking s--- to them, but our meeting rooms, I'm telling our guys that and I think a lot of times before games, a lot of guys are beat mentally. I can tell you that first-hand from my rookie year. You look at guys on paper, size and speed, that s--- don't matter." Later in the podcast - the whole thing was pretty entertaining, by the way - Austin asked Johnson if he ever found out why Malcolm Butler didn't play in the Super Bowl. Johnson said he didn't know for sure and that no one ever will. He said Patriots players say in the media what the team tells them to - "Like I said, they're robots." But at least Johnson didn't leave the hour-long interview without giving out some credit to the team in New England. He talked about how difficult it will be to repeat and sustain a level of excellence, something the Patriots have been able to do unlike any other team in recent history. "I think we can learn from the Patriots, even though I don't like them," Johnson said. "I think you can learn from them. They've had that consistency year in and year out for a long time and it's hard. People want to pat you on the back and tell you how good you are. And that's the worst thing you can do, to have that relief factor, kind of pause and think everything's made for you."